Pictured "Spirit Of the Stars-Galaxy"
Featuring our gorgeous Cappuccino Royale daughter. 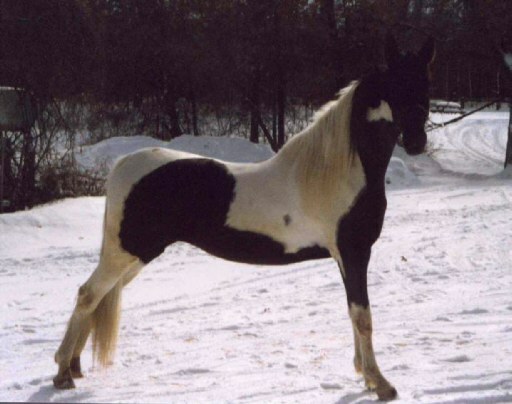 Galaxy had a black and white HOMOZYGOUS filly by Hot August Nite on June 1st,2001! We are really excited! Check out her on the Tanza-Nite link. We have high hopes for her! We are located in the suburbs of Minneapolis Minnesota. We live on 44 acres in Princeton, Minnesota. NEWSFLASH! Tanza-Nite has been bred to Monaco for a late May foal! Puppies due March 2004 by Apple Acres Odyssey Outline! See the Dogs page for details and pictures of dogs we own. Galaxy Photos Featuring Tanza-Nite The Dogs!